At Monday’s Southwark Crown Court hearing for mention and fix for my Appeal, the listing clerk apologetically explained that she had requested the presence of two magistrates for the scheduled December dates as early as September 30th. She was notified only late afternoon Friday that none were available. The Court eventually did however manage to find enough jurors for the Legal Argument part of my Appeal to go ahead by having surplus jurors sent over from the Old Bailey. Mid-morning, I was contacted by my barrister who said that the Legal Arguments might proceed if I was still able to attend. Did the Court want a hearing without media attention and without supporters or counter-protesters? 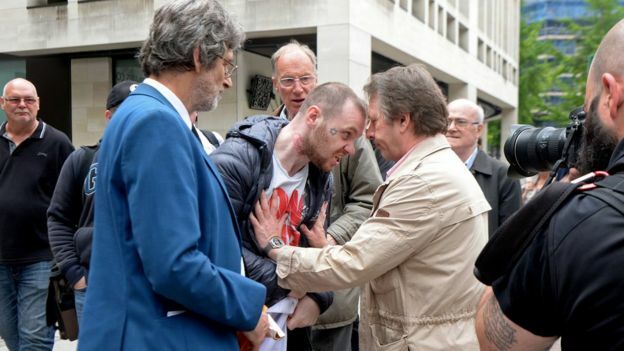 I certainly wasn’t going to be able to organise security at such short notice, not to mention the worry of being arrested outside court as happened in October 2017, when I was handcuffed, thrown into the back of a freezing police van and held in custody for 48 hours – for singing songs! A couple of supporters who for some reason had not received my update did turn up in Southwark. Yesterday’s events as described to me by one of them confirm the impression of yet another scene from a satire by Molière: papers endlessly shuffled around or lost; yet another new judge who admitted not having read either of the briefs submitted; vanishing jurors… In short, a total fiasco. The Appeal has now been rescheduled for three days starting February 11th. FREE SYNDICATION: We are partners not rivals. Reprint our news stories to quickly build your news platforms. We’re used to Russian, Chinese, Iranian and Saudi Arabian dissidents. However, the most notorious deniers of free speech are found under upturned rocks in the West. Investigative journalist Julian Assange sought sanctuary in London’s tiny Ecuadorian embassy in 2012. The whistle-blower refuses to be silenced. The Australian has been awarded more than a dozen journalism awards. Once evicted under a dodgy-deal, blackmail and bribery, Assange faces life imprisonment, perhaps a death sentence. Thanks to a clerical error by the U.S. attorney’s office in Alexandria, Virginia, the existence of sealed criminal charges against the Wikileaks founder has been confirmed. What is typically left out is that Wikileaks originally released the diplomatic cables in piecemeal form, with names removed to prevent loss of life and minimize harm. It was only after a Guardian journalist’s error led to the full legally edited cables leaking to third parties on the web that Wikileaks also published them. Assange even attempted to warn the office of Hillary Clinton, then U.S. Secretary of State. In other words, Wikileaks behaved precisely as any responsible journalist would in handling sensitive material should by removing information that could cause harm. The removals stopped only when they became pointless. The Pentagon later admitted under oath that they could not find any instances of individuals losing their lives as a result of being named in Manning’s leaks to Wikileaks. When it comes to negligence a far stronger case can be made against Hillary Clinton for the way she handled State Department emails. Yet, no criminal charges have been laid against a woman mired in corruption and whose snail-trail lies over a score of corpses. Assange is being targeted because he dared to challenge the western establishment but he is far from alone. Western governments routinely target scores of news reporting dissidents. 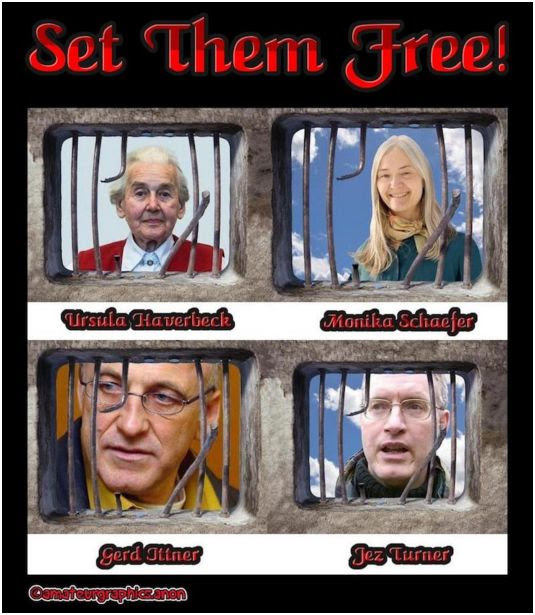 Imprisoned in Germany merely for investigating holocaust related fraud; Ursula Haverbeck (90), lawyer Sylvia Stolz, Music tutor Monika Schaeffer and her brother Alfred Schaeffer. In France, Professor Robert Faurisson, Brigitte Bardot, and Vincent Reynouard. The list of Western dissidents is as long and silent as are the names on the Cenotaph situated in Whitehall. Any who associated with Julian Assange are pursued. Another well-known dissident is the National Security Agency (NSA) whistle-blower Edward Snowden. It was a time of globalist unease at the power of the internet to undermine authority. Who would have thought that the highest court in Europe would uphold a case in which a woman was prosecuted for blasphemy against Islam? Who would have thought that Britain, the supposed birthplace of liberalism and the free press would ban an independent journalist from its shores for satirising the same religion? Who would have thought that Germany, whose living memory of the totalitarian Stasi is just three decades old, would put its largest opposition party under surveillance? Just a few years ago, all three would sound far-fetched. But cases like these have become common as elites in virtually every western country mount a panicked attempt to contain the rise of populism. A case in point is Tommy Robinson, the British critic of Islam who was dragged through Britain’s courts on fuzzy contempt-of-court charges. Sentenced to an astounding thirteen-month imprisonment, Robinson was eventually freed after a successful appeal. Robinson now awaits a final trial before Britain’s Attorney General. Shaky charges that have been successfully appealed were exploited to persecute a British citizen who was inconvenient to the establishment. Alison Chabloz is endlessly re-cycled through British courts at the urging of Jewish special interest groups. She has been sentenced, fined and ordered to work for the State without charge. Her crime, she satirises the spin of World War II propagandists. Again in Britain, Jez Turner is sentenced to 12 months in prison merely for publicly stating that Britain’s regime is overly influenced by Zionists; ironically, Zionists boast much the same thing. In the self-styled cradle of democracy, one of the last European countries to give voting rights to men and women, Michael Walsh was handed down 6 x 4-month prison sentences for publishing fliers critical of immigration. Britain routinely bans foreign politicians and media figures from the country for being right-wing. Michael Savage, Geert Wilders, Lauren Southern, Pamela Geller, and Robert Spencer all enjoy this dubious distinction. Theresa May, who was responsible for internal affairs and immigration when Spencer and Geller were banned, is the Prime Minister. Trump’s White House, supposedly an ally of populists, failed to intervene on behalf of the American citizens banned from the U.K. for expressing populist viewpoints. Julian Assange, a leftist oriented libertarian may share little ideological ground with right-wing critics of Islam. But they all share at least one thing: persecution by the Western States coupled with anti-establishment political speech or activities. We also see attacks on free speech, with governments and politicians across the West pressuring Silicon Valley to suppress its critics. These toxic unaccountable, unelected elite can sweep away a person’s livelihood in minutes, and cut their political message off from millions of American citizens. PayPal, Twitter, YouTube, Facebook routinely disconnect the accounts of even small ‘c’ conservatives. Undeniably, the West is as repressive as was the former Soviet Bloc. Who would have thought that countries like Ecuador, Russia, and Iran would offer sanctuary, safe passage and freedom to speak to Western dissidents; journalists, authors, poets, writers, libertarians and political activists? Edward Snowden faces life in Russia as an exile for revealing the National Security Agency (NSA) mass surveillance of Americans. Before that, he sought refuge in Hong Kong, a Special Administrative Region of the People’s Republic of China. Thank you to all who replied to my last email which included my latest parody “Lying Thieves”. Apologies for not responding individually and for yet another impersonal mass email: busy times ahead! Please do let me know if you didn’t receive the song and I will send you a copy. Upcoming court dates for my Appeal against conviction and sentencing are scheduled for December 10, 11 and 12 at Southwark Crown Court in central London. My solicitor informs it is quite possible that the court may have other urgent business and may therefore have to postpone. In other news, I was honoured to lay a wreath at the Cenotaph in London last Sunday November 11 in remembrance of the 784 members of the British Armed Forces who lost their lives during the peacekeeping mission to Palestine 1945-1948. Below you will find the link to some photos and a short video of the speeches given by Richard Edmonds, Tony Martin, Jordan Pont and myself at the rally afterwards. Many thanks to National Front Chairman and Deputy Chairman for organising the traditional Remembrance Day parade and allowing me to participate. Finally, alongside preparations for my Appeal, I have been submitting several Subject Access Requests (SAR) to various organisations all involved to some extent in the conspiracy to have me prosecuted (visibly not for the “sending” of my songs over the Internet, but rather for the messages contained within the songs themselves). Companies and organisations must comply within 30 days according to the new GDPR rules. One organisation showing particular reticence is The Jewish Chronicle. My SAR to the JC was submitted following an online article which associates the Pittsburgh Synagogue shooting with “UK far right extremists” on Gab, one of the social media platforms used by the shooter and which the enemies of free speech wish to see closed down. As well as citing my name, the JC article goes further in claiming that I would use Gab to “urge supporters” to donate via PayPal to a “legal fund”. In short, the JC’s unfounded allegation inevitably led to my PayPal account being shut down last Tuesday, without explanation and without recourse to appeal. In addition to my SAR, I have submitted a complaint about the JC article to the Independent Press Standards Organisation. A couple of recent posts published on my website give details of successful SARs so far (link below). On the advice of a friend, I have set up an alternative to PayPal which can be found on my website. Again, thanks to all for your support and messages of good will. I will keep you informed concerning my Appeal and hope to see a good turnout at Southwark Crown Court on the day. PS If you no longer wish to receive emails please let me know. The National Front marked the 100th Anniversary of the end of World War I by parading to the Cenotaph. Members and supporters of the National Front paraded through London laying wreaths at the Cenotaph and the Memorial to the Women who served in World War II, Then held an outdoor rally near by. The Subject Access Request dealt with by Edinburgh Fringe was the first and, to date, the most helpful of all SARs submitted. The 2016 EdFringe SAR contains much the same sort of complaints made against me as in 2015. Revealingly, even EdFringe staff admit that one particular Twitter account, RTingBot, is focused on me and is attempting to get me prosecuted. Loveliest court guard was as happy as me: You’re saying everything that everyone thinks but daren’t say out loud. I made it quite plain in my interview that if the authorities wish to lock up a politically incorrect singer, then they can go ahead. Interested to hear of the media / net reaction – no access here – so please put all links on to a page / email so I can read when I get out. I always enjoy reading R.H.’s court reports – he should be a court reporter! I liked the stamps very much. On my arrival another chap had a book and I asked him if I could borrow it while we waited and he said ‘Give it to me next week’ – it saved my life ‘cos nothing to read in the first week here. The book was all about Malta and the aerial duals between Me’s and Macchis vs. Hurricanes and Spitfires! Spits were a big improvement on Hurries BUT the fuel tank was in front of the pilot – not good! Anyway, whole show was a complete waste of life and poor Maltese caught in the middle. Do hope your trial verdict goes better than mine – by time you receive this you’ll know. I won’t know till S. visits me on Wednesday. Pleased that Paris went well and the Vichy video came through – a change is as good as a rest!! Mail for me is censored, but anonymous mail does get through. Please tell everyone that my spirits are high and that I’m enjoying my holiday at Her Majesty’s Expense! I will return refreshed to the fray! Good to hear Jez is in good spirits. Attached below is my latest blog post along with photographs taken last week during the glorious sunny spell up here in the Peak District (Derbyshire). Hawthorn at its best, lambs in the field and even a paddling cow. Thanks again for your much appreciated support. Chabloz claimed the Holocaust was “a bunch of lies” and referred to Auschwitz as a “theme park”. She was warned she may be jailed at her sentencing on 14 June. There was scuffle outside court. Chabloz was convicted of two counts of sending an offensive, indecent or menacing message through a public communications network. She was further convicted of a third charge relating to a song on YouTube. When the verdict was given supporters of Chabloz shouted “shame” from the public gallery. When Chabloz left court there was a scuffle and heated arguments outside, before police arrived to keep the peace. 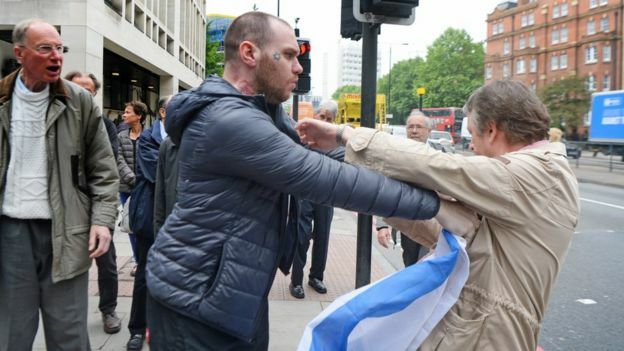 Gideon Falter, the group’s chairman, said: “Alison Chabloz has dedicated herself over the course of years to inciting others to hate Jews, principally by claiming that the Holocaust was a hoax perpetrated by Jews to defraud the world. A CPS spokesman said it first became aware of the private prosecution in December 2016 when Alison Chabloz’s solicitors asked the CPS to take it over and stop it. However, in 2017, the CPS determined the case should continue and Alison Chabloz was prosecuted. 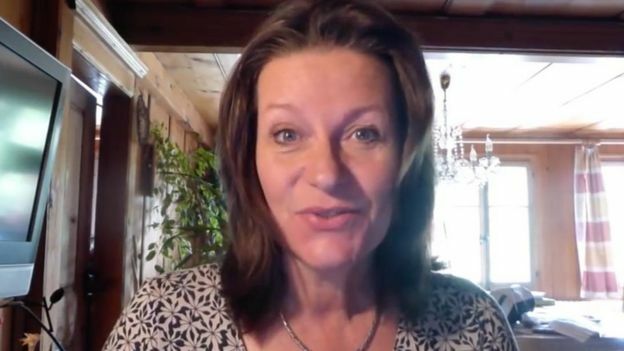 Chabloz, who describes herself as a Holocaust revisionist, said her music was “satire” and had previously told the court there was “no proof” gas chambers were used to kill Jewish people in World War Two. However, prosecutors said three of Chabloz’s songs, including one which referred to the notorious Nazi death camp Auschwitz as a “theme park”, were criminally offensive. HONESTY BOX Our news isn’t free for those who work to bring it to you; we depend on donations (click TeamWork). Please share our stories and purchase from our bookstore. 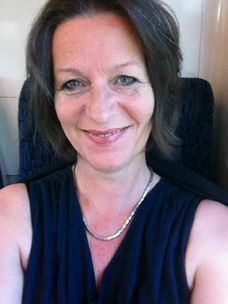 With the dreary predictability expected of a tinpot police state, outspoken dissident, Alison Chabloz on May 25 was found guilty on all counts when the attractive defendant appeared before Marylebone Magistrates Court. This throwback to the Soviet system boasts a corporate media in perfect harmony with the prosecuting counsel. Anyone, no matter how remote, who could be relied on to debauch the dissident’s reputation was media quoted at length. In Britain and the USSR, its once ally, you get two trials; one state and one media with both outcomes being predictable. It is highly likely that the defendant is tried and convicted, and the media pen-ready, before the trial even takes place. Like elections, the rest is a theatre for the gullible Goyim. The state charges that directly or indirectly the parody melodies the popular chanteuse sang were deemed to have been ‘grossly offensive’. She has yet to be sentenced because judge John Judge Zani, (they’re called beaks, in England), called for a probation report prior to sentencing Alison on June 14. A problem for Alison, you cannot go to prison for ‘offensive’ material but you can lose your liberty for ‘grossly offensive’ material. It is unclear as to how one defines the difference. This is not of course an oversight by men in dark places who decide these things. The unarguable outcome is that in Britain there is only one opinion that is permissible, the globalists politically correct view. Whatever one’s political convictions, one has to ask do we really want to live in a state that sends dissidents to prison for being politically unfashionable. This sums up Absurdistan today. Britain is using the state police, the courts, and prisons and the press to stifle debate on government immigration and foreign policy; it questions the right of Britons to take responsibility for their sovereignty. Read this passage again and again as it cannot be put clearer than that. 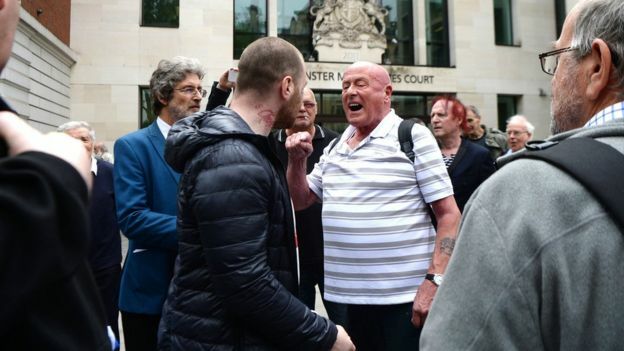 There was a strong turnout at Alison’s trial and a tsunami of sympathy and support, none of which was reported by corporate and state media (BBC). If You’re in London, Come Out and Support Chanteuse and Satirist Alison Chabloz When the Verdict is Read, Friday, May 25th, at 10:00 a.m.
Several arrests, multiple charges, ten court hearings, 18 months on bail and two days in jail – all for singing satirical songs alleged to be grossly offensive. 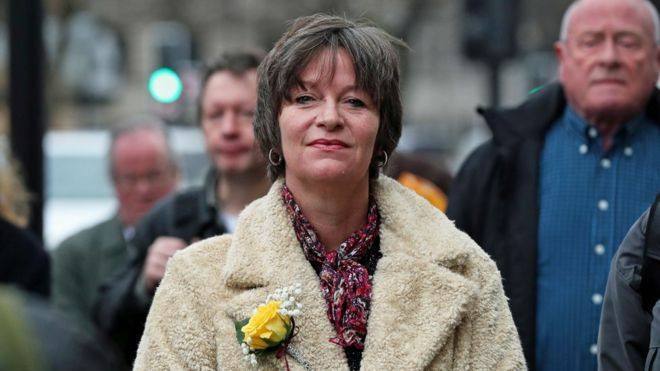 Finally, the verdict in Alison Chabloz’ case will be pronounced 10 am this coming Friday, May 25th at Westminster Magistrates Court, Marylebone Rd, London. Please do come along and show your solidarity. Rendezvous Marylebone station forecourt from 9 am.